He'd slash your granny's face up given half a chance. Until he met with Savage Sid. Sidney stared right back in his eye. and Benny got a cold meat pie. Much to the people's delight. Sidney grabbed a hatchet, buried it .... in Benny's head. The end of a Ted? Well, they dragged him from the wreckage of the Palais in bits. They tried to stick together all the bits that would fit. As the bouncer at St. Peter's Gate. 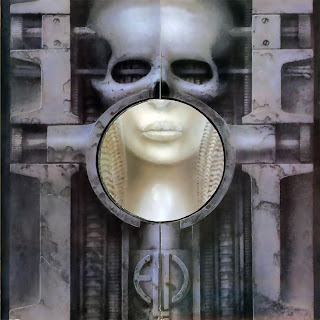 Brain Salad Surgery is the fourth studio album by progressive rock band Emerson, Lake & Palmer, released in 1973 and the first under their Manticore Records imprint. It fuses rock and classical themes. Greg Lake wrote the lyrics for the album with the assistance (on two tracks, "Karn Evil 9: 3rd Impression" and "Benny the Bouncer") of former King Crimson bandmate (and, beginning with this album, frequent ELP collaborator) Peter Sinfield. This was the first Emerson, Lake & Palmer album to have no songwriting contributions from Carl Palmer. The cover art is by H. R. Giger.